I have two friends who are a married couple. They frequently go on missionary trips together to some of the most impoverished areas of various countries. They raise money to go on the trips and minister to the physical and spiritual needs of the people. The people get to know them and look forward to their return visits. They bring love and hope to people who feel invisible and forgotten. They are changing that world one trip at a time. The amazing thing is that they never went through any big time training or joined any particular organizations to do what they do. No one sends them to do this. It’s something they feel called to do. So, they do it. The work they do is life-changing, and they didn’t get anyone’s permission to do it. They didn’t stall out and look around for safety nets to catch them. They got organized, got educated, and made very deliberate plans to positively impact the lives of others. We were all created with free will, creativity, desires, passions, talents, abilities, and intellect. We don’t need permission from anyone to develop those things. While there are various pathways of education to master professional skills, that should not be an excuse to do nothing, right now. Do what you can with what you have. There is a starting point for all things. Remember the saying, “Do not despise small beginnings.” Don’t underestimate the power of your present abilities. It takes a change in perspective to see opportunities available to you. Boring, everyday things could be the entryway to amazing things to come. When you start where you are, things will not seem to be amazing. But begin with those things and you will move on to do things that are more challenging and exciting. Working through fear means, working in spite of your fear. In the face of fear, we often hide behind excuses of not being qualified or educated enough. Because of this, we spend time seeking approval or permission before taking action. Everyone can do meaningful things in life. From the credentialed to the non-credentialed. There are things we can do at any stage of knowledge or level of skill. Take it one day at a time and one step at a time. Before you know it you will have gradually achieved your goals with patience and persistence. 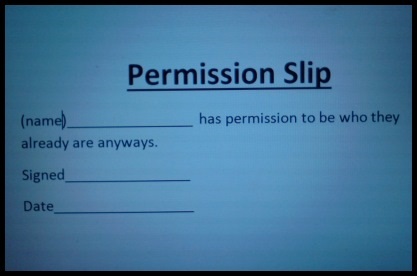 Sign your permission slip and live your life. What is something you have been waiting for permission or approval to do? Think of at least one thing you can do today to move toward achieving that thing. After you have done that one thing, think of the next thing and do it. And then the next. And the next. Share your milestones and successes with people who will appreciate it and celebrate it with you. That will encourage you to keep the momentum going.